Also known as Deadlift from a Deficit. 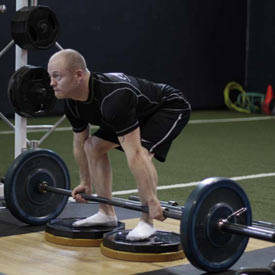 Begin by having a platform or weight plates that you can stand on, usually 1-3 inches in height. Approach the bar so that it is centered over your feet. You feet should be about hip width apart. Bend at the hip to grip the bar at shoulder width, allowing your shoulder blades to protract. 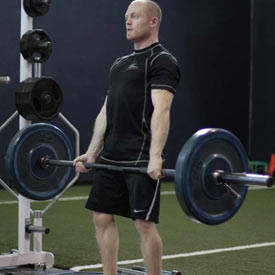 Typically, you would use an overhand grip or an over/under grip on heavier sets.